The original script for Ozu’s “The Flavor of Green Tea over Rice” was written and submitted to Censorship Board in 1939. The script was rejected, and Shochiku had to shelve it with no prospect for the production. The story concerns the man of humble origin but hard-working and his spoiled wife from rich family. The husband is too serious and boring for her taste, so the wife goes on spending spree and expensive trips. But the husband receives the draft notice, which upsets her. She realizes that her husband is quite a remarkable person, being calm when facing such a life-turning event. They quietly enjoys the last meal of “Ochazuke (Green Tea over Rice)” the night before his joining army. The reason for the rejection was often said that “Ochazuke” is too depressing meal for a Japanese man going to the war. But it was more likely that the description of wife’s decadent behavior is unacceptable even if she realizes her wrongs in the end. Shochiku was probably most successful in making woman’s melodrama during 30’s. The company had Ozu, Shimizu and Nomura in house, churning out contemporary love stories and family dramas every week. It avoided sword plays, historical dramas and war actions. Their value lies in pure entertainment. Good stories, warm human angles and tearjerkers. The company was bewildered and confused when the Censorship Board demanded cooperation with totalitarian policies. 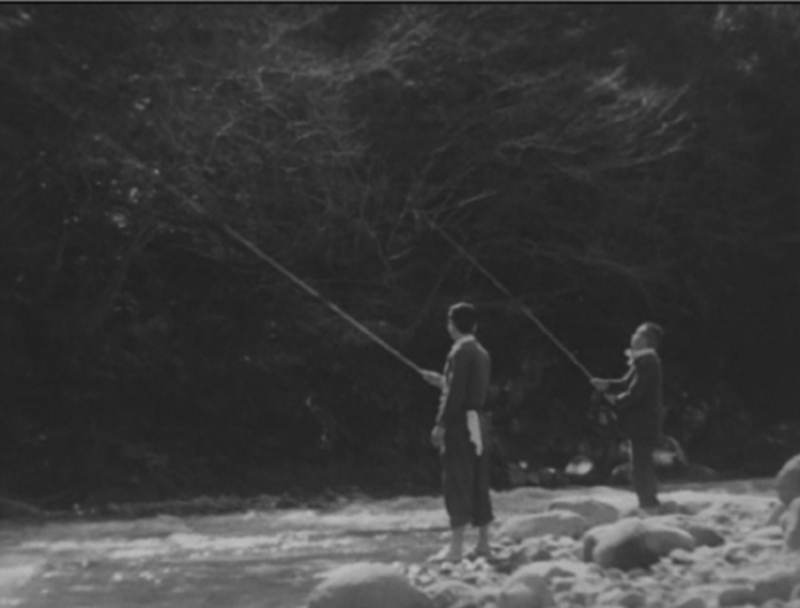 It was said that rejection of Ozu’s script was tremendous shock for the studio, its executives and creators. And I suspect that was the intention of the reject. To shock them. To show them who was in charge now. The round-table discussion published in “Nihon Eiga (Japanese Cinema)” in 1944 is a very rare occasion to observe how the Censorship Board perceived the art of cinema. The participants were officials of Interior Ministry and Censorship Board. They agreed on one thing; creators should stop considering the art and the greater cause two different matters. They are equal and one. The officials blamed it on commercialism which had tainted the film industry before the war. One of the Censorship Officials, Yoshio Tsukushi, described how he had “corrected” a wrong passage in one of the scripts he censored. In one of censorship meeting on a children film, he told its screenwriter how to interpret and portray life in an elementary school and demanded rewrite. According to him, the writer was enlightened by this direction and understood things better. Asked by the mediator if he, the censorship officer, was ever enlightened by the creators, Tsukushi triumphantly replied, No, we think much harder, we do better job. This unbelievable ignorant arrogance ruled all the creative process at the time of “There Was A Father”. You can’t fight against this misallocation of power using normal channel of human communication. In addition, Shochiku had to show at least a bit of their loyalty to Japanese government, otherwise it would no longer be able to make any film. The level of cooperation with totalitarian government, especially Censorship Board, varied from one creator to other. Some of them produced straight war propaganda, others were ambivalent. (News media were notoriously cooperative.) After the war, when the war-time cooperation was accused as war crimes, some of the collaborators said they had done what they were told. Then, who told them? Government Officials. Then, those officials said we did what we were told, by … higher ups. Since the original print at the time of release is missing, we do not the extent of wartime propaganda infused in this film. Supreme Commander of the Allied Powers (SCAP), Occupation Forces in Japan after the war, reviewed the libraries of Japanese films before and during the war. Straight propaganda films or films of feudal philosophy were confiscated and sent to Library of Congress in United States. Other films with minor military influences underwent censorship process, in which the undesirable parts were cut. “There Was A Father” was one of them. All the elements of propaganda in the film were edited. The recent discovery of the print (the Gosfilmofond print, the print confiscated by Soviet Army) shed some light upon this issue, though still incomplete. The patriotic poetry reading by Chishu Ryu, several lines of the war in China and the popular song at the end of the film are the scenes missing in the previous print. These elements did color the film more militaristic and patriotic way, but only to a certain extent. Though the poetry itself is an awful blasphemy (very popular during the war nonetheless), the images of zashiki from the extreme low position camera was fantastic. One of the “original” elements I do have a problem is that ludicrous song blasting over the image of the night train at the ending. Oh well, people in 1941 must have seen the film with this ending. This song certainly reminded them of the future of the son: a soldier. I personally prefer the quiet, lingering and hellish ending as we know it. Polyhedrous nature of this film made me question my first impression. This polyhedron has many faces missing, edges bluerred and shifts its reflections. Through these imperfections, we might find sweetness of the “other” world, real hell on earth, longing for lost family, hopes never fulfilled. Also, we may find the film director and his team confused, at loss about female characters, but firmly perfecting their art and styles, combatting against material shortage. Lighting was not satisfactory, but they had eye for the better images. Film stocks were not what they wished for, but they concenrated on telling a story. The studio executives were afraid of the govenment intervention, but the team wanted to make something different. They mastered their art, they captured landscape of the country they loved, they accomplished amazing level of perfection despite of sorry state of their environment. There is one thing they had never expected, though. Seventy years later, this film is appreciated by many film lovers all over the world, including those in the countries Japan was fighting against at the time. Cinema is wonderful form of communication.